For Microsoft, 1987 brings the announcement of Excel for Windows, we ship our first CD-ROM application and Microsoft announces the "New Mouse" which is nicknamed the "Dove Soap Bar". 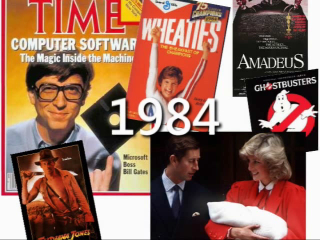 The 1987 fiscal year-end sales total $345,890,000. The 1987 fiscal Year employee headcount totals 1,816 people. A total redesign of corporate materials is introduced. Spearheading the new corporate identity is a new logo, "Pacman Logo," earmarked by its simplicity, and a clean, uncluttered design. Says designer Scott Baker, "The former logo ( the 'Blibbet' ( was more in keeping with how we saw our company five years ago." The new logo, in Helvetica italic typeface, has a slash between the "o" and "s" to emphasize the "soft" part of the name and convey motion and speed. 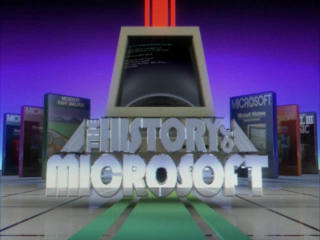 Microsoft and IBM announce OS/2. 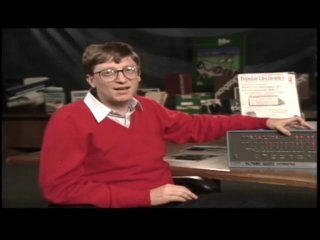 This is the first product to be announced as a result of the Joint Development Agreement between Microsoft and IBM in August 1985. Bill Gates throws the first pitch to start the Seattle Mariners baseball game. In honor of the birthday of Buck Ferguson, Director of Investor Relations, a 300-lb., 16-foot duck appears in "Lake Bill." This is part of a running gag about Buck's concern over too many ducks in the pond. Microsoft acquires Forethought, the developer of PowerPoint, a leading desktop presentation application. Microsoft announces the “New Mouse”, 1.0, a plug-compatible mouse. The design of the mouse is nicknamed the “Dove Soap Bar”. 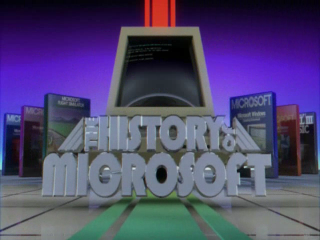 Microsoft ships its first CD-ROM application, Microsoft Bookshelf, a collection of 10 of the most popular and useful reference works on a single CD-ROM disk. Microsoft unveils Works for DOS, a breakthrough productivity software package for Home/Small Business workers. Microsoft announces Excel for Windows offering unprecedented functionality, presentation capabilities, and customizability to spreadsheet users. It ships November 19. Microsoft acquires InterMail, an electronic mail program for Apple Macintosh systems developed by Interactive Network Technologies Inc. It will ship one month later as Microsoft Mail 1.0 for the Mac. Windows 2.0 and Windows/386 ships to dealers and distributors. § Treaty: Soviet Secretary Gorbachev and U.S. President Reagan sign the INF Treaty, reducing nuclear stockpiles. § Stock Market: The Dow Jones Industrial Average closes above 2,000, then 2,500, for the first time, before plummeting back to 1738 barely three months later on Black Monday – the second largest one-day percentage decline in stock market history. § People: The world population reaches 5 billion. § Flight: 19-year-old West German Mathias Rust lands a private plane in Red Square, Moscow. He is arrested and serves 432 days in jail. § Music: Guns N’ Roses’ debut album Appetite for Destruction is the #1 album in the U.S. and Johnny Logan from Ireland wins the Eurovision Song Contest with Hold Me Now. § Typhoon: Category 5 Typhoon Nina pounds the Philippines with 165 MPH winds and a devastating storm surge, killing 1,036 and causing an estimated $40 million worth of damage. § Court: The U.S. Senate rejects the controversial nomination of Robert Bork for Supreme Court Justice. § Transfer: Portugal agrees to return sovereignty over Macau to China in 1999. § TV: The Cosby Show, Night Court, and ALF are among the top U.S. television programs. Full House, thirtysomething, and A Different World premiere. § Middle East: The Israeli-Palestinian conflict erupts into the First Intifada in the West Bank and Gaza. § Computers: IBM introduces the PS/2, popularizing the 3.5” floppy and bringing 256-color displays to home PCs for the first time through the introduction of the VGA standard. § Iran-Contra: Oliver North, John Poindexter and Secretary of Defense Caspar Weinberger testify before Congress about the Iran-Contra Affair. § New Age: The Harmonic Convergence is observed around the world. § Games: Final Fantasy premieres on the Nintendo videogame system. § PTL: Americans are mesmerized by scandals surrounding televangelists Jim and Tammy Faye Bakker and their PTL Club. § Earthquake: The magnitude 5.9 Whittier earthquake strikes the Los Angeles area, leaving 100 injured and eight dead. § Drugs: The FDA approves anti-AIDS drug AZT and antidepressant Prozac for sale in the U.S. market. § Nazi: Former Gestapo leader Klaus Barbie is convicted of war crimes in Lyon, France. § Chips: Sun introduces the SPARC processor. § Yachting: The America’s Cup returns to the U.S. as San Diego Yacht Club challenger Stars & Stripes ’87 defeats Australian defender Kookaburra III. § Movies: Top grossing movies of the year include Three Men and a Baby, Fatal Attraction, The Untouchables, and Lethal Weapon. The Last Emperor nets Oscars for Best Movie and Best Director (Bernardo Bertolucci). Sous le soleil de Satan (Under the Sun of Satan) wins the Palme d’Or at Cannes. § The first FAX boards, which let people send and receive faxes on a PC, are shown at COMDEX. § Sun Microsystems debuts its first RISC (Reduced Instruction Set Computing) workstation. Paul Simon wins the best-album Grammy for "Graceland." 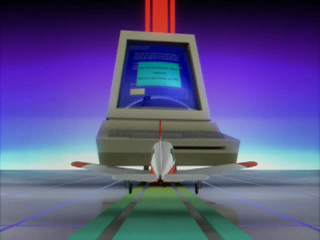 Ok, can I be the first to point out that the SUN screenshots were of an Acorn machine running RISC OS? Wow, time flies. This series really takes me down memory lane. The PS/2 micro channel bus didn't take off, did it? A little too late for IBM. Too many clones already out there to try to set a new standard. 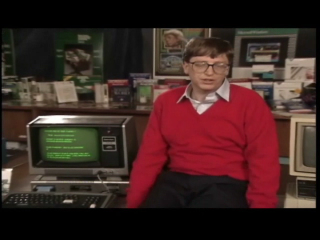 That was the most rehearsed Bill Gates interview yet in this series. But still fascinating. I like to introduce my self my name is Jose Octavio Martinez. 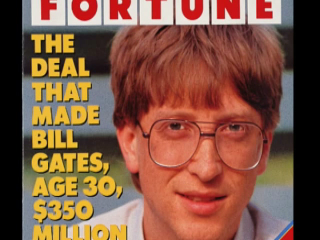 Bill Gates your a true genius I'm glad the the sequence to the universe is in good hands. Im glad everything turn out good I hope non of that negative energy ever gets reveal again it's to dangerous for society. Thank your for your time its a true blessing.